Most of those in my age bracket got their first basic education in the history and use of frontier firearms from the movies, both the wonderful old B movies as well as some great classics made by the likes of John Wayne, Randolph Scott, and even Henry Fonda. It was only as we grew older that we realized how unsafe gun handling was as presented on the silver screen and also how badly history was treated. As I learned of the time frame of the evolution of single action sixguns and leverguns, it bothered me greatly to see Colt Single Actions in Civil War movies and especially to see Winchester leverguns used in any movie from those depicting the War with Mexico forward. 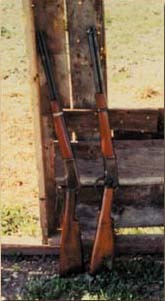 Most of the time, the leverguns used were Model ’92 Winchesters. The model number denotes the year and the Old West was pretty well gone by 1892. By then, the buffalo, the stagecoach, even the gunfighter was a relic of the past. There were still pockets of relatively rough country left in 1892, especially in the Southwest, still are, and the Model 1892 Winchester filled the bill for survival quite well. At least for a short time, Rangers, both Texas and Arizona style, picked up on the soon to arrive Model 1894 Winchester in the more “modern” .30 Winchester Centerfire, or .30WCF, or as most of us call it, the plain old .30-30. The Winchester ’73 is usually thought of as the “Gun That Won The West” while the Model 1892 gave shooters a much stronger action in the same chamberings. Many of shootists of the Old West packed a Colt Single Action with a Model 1873 in the same chambering. As the Old West began to disappear, the Model 1873 was often replaced by the Model 1892. Interestingly enough, the .32-20 was very popular in both the Colt Single Action and Bisley Model as well as the Model 1892 in the 1890’s and beyond. Apparently, many felt the larger calibers were no longer as necessary as they had been. When Oliver Winchester’s son-in-law journeyed West in the early 1880’s to meet with a young Utah gunsmith by the name of John Browning, neither could have had any idea of the great effect that meeting would have on rifle production. Winchester got Browning’s designs for what would become the 1886 levergun and 1885 Hi-Wall, and in just a few short years, Browning would miniaturize the Model 1886 with the result being the slickest little levergun ever, the Winchester Model 1892.
Who can ever forget the classic scene in Stagecoach as John Wayne (Ringo) twirls his large looped lever Model ’92 and stops the coach? Or the greatest scene of all Westerns, Rooster Cogburn with his ’92 in his right hand, Colt Single Action in his left, and with teeth clenched around the reins as he goes forth to meet the Ned Pepper gang inTrue Grit? Sandwiched in between these two, those of us old enough will remember seeing Lucas McCain use his large lever Model ’92 to great effect each week in The Rifleman. The real star of all of these scenes was the Model ’92. In the past few years, the replica Model 1892 has been imported from Brazil, Italy, and Japan under such names as Browning, Cimarron, EMF, Navy Arms, and Winchester. All well made, good shootin’ leverguns regularly seen at cowboy shootin’ matches around the country. One also finds many competitors who have searched the used gun market to come up with authentic Winchester Model 1892’s. The real ‘92’s are not cheap, but I have been able to come up with a pair, one for $400 and the other at $600. Check that out against some of the prices of the replicas, and especially the replica 1866’s and 1873’s! More than one million Winchester Model 1892’s were produced from 1892 to 1931, so it should be three times easier to find a Model ’92 than a Colt Single Action. The three main chamberings, just as in the Model 1873, were .44 WCF, .38 WCF, and .32 WCF, or as they are better known today, .44-40, .38-40, and .32-20. Two other chamberings are found — the .25-20 and the very rare .218 Bee. During the 1950’s, many 1892’s were converted to .357 Magnum or .44 Magnum. The originals ended production before the advent of either Magnum, so none were ever produced in these chamberings nor in .45 Colt. With a 20″ barrel, the Model 1892 weighs around six pounds, and it is an easy handlin’ levergun, probably the best ever. In addition to a round-barreled 20″ version, as most encountered will be, there are also 24″ rifles and 30″ muskets with barrels that are round, octagon, or half round/half octagon. Take-down models will also be encountered. Stocks are normally of the straight grip variety of oil-finished walnut. Front sights are usually a post or bead with the rear sight a buckhorn or semi-buck. In addition to being a great gun for Cowboy Action ShootingTM, the Winchester Model 1892 in .38-40 or .44-40 makes a fine close range deer rifle when properly loaded. Older manuals have loads for the .44-40 in the Model ’92 that eclipse the .44 Magnum. For turkeys and the like, the .32-20 and .25-20 are just about perfect where their use is allowed by the game laws. My two Model 1892’s are both 20″ carbines, one in .32-20 and the other, .38-40. The first cost me $600 and has plenty of character on the outside and a perfect bore. The .38-40, at $400, has been refinished and the bore had some pitting making it a so-so shooter. It has now been re-barreled by gunsmith Keith DeHart using a Douglas barrel of .401″ groove diameter and contoured to match the original barrel. Both guns not only shoot like those we dream about, they also fairly reek of nostalgia.